When moving into a new house, it is always a given that homeowners are going to make some changes over the years to make it adequately suited for their unique home. Flooring is one of the most significant renovations because it is vital to both the appearance and the use of a room. If you find yourself in this position, it might be a good idea to visit your local tile store and learn a little bit more about porcelain tiles. Long-lasting: Listen, new flooring of any kind requires an initial investment. It is an unfortunate fact of life and home-ownership. It can hurt the wallet in the beginning and because of this many people understandably choose cheaper flooring options. This strategy will cost you more in the long run though. It is essential to realize that you get what you pay for. Of course, there is nothing wrong with choosing less expensive options. But you have to understand that it might only be a couple of years before you will need to replace your flooring and that will cost more money. Due to this many homeowners believe that it is worth it to pay a little bit more for the materials which will last for years. The same case is with porcelain tiles because if you take proper care of them, they can last your lifetime. After all, you can still find preserved tiles from the 13th century in buildings across Europe. This kind of lifespan will save you money in the long run while also increasing the value of your home. Anyone who is planning on staying in their home long term should consider tile. Less Porous: This is the quality that gives tiles their long lifespan. Being less porous means that they are a very dense and durable material. Chipping is a concern, but this will only occur if you will drop very heavy items on the tile or if it falls itself. These are two things that you can easily avoid by taking proper care of them. Since they are not very porous stains are also not much of a concern. The lack of pores means that any liquids spilled on the floor will sit on top of them rather than soak into the item itself. Due to this trait tiles are perfect for environments where spills are a common occurrence like the kitchen. Since they deal so well with moisture, they are also great for washrooms and basements. Anywhere that moisture or humidity is a concern you should consider tiles because they won’t stain like carpet or get warped like wooden floors. Timeless: Another reason to choose porcelain tiles for your floor is that they are a classic choice. We’ve already mentioned that people used them since the 13th century. And the fact that many people use them today is a testament to their timeless appeal. They can be simple and serve a very practical purpose. But they can also become works of art since they are available in every color under the sun. You can even use them to create patterns and mosaics. Regardless of the kind of tiled look you decide on, they will create a beautiful and sleek space for your home. Retro rhombus porcelain mosaic tiles. Source. Now that you know a few of the important advantages that porcelain tiles offer it might be interesting to learn a little more about what they are. Porcelain is clay which is baked at an extremely high temperature to give it strength. It is 3,000 degrees in a kiln to be exact! A glaze is then baked onto the clay during the production process. This part is crucial because the glaze is what keeps the clay from absorbing liquids and moisture. It is what makes the tiles stain resistant. Also, this technique makes the tile so dense, that some are even frost resistant and you can use them in outdoor spaces. It is durable regardless of the wear-and-tear you throw at it and is among the most permanent flooring available. Hexagon porcelain field tile. Source. After the baking it is time to cut the tiles. The hardness of the material allows it to be cut with defined and precise edges. The classic square and rectangle shapes are the most common, but there are many different forms of the tiles. After all, the variety of colors and shapes that tiles come in is one of the most fun aspects of the flooring. 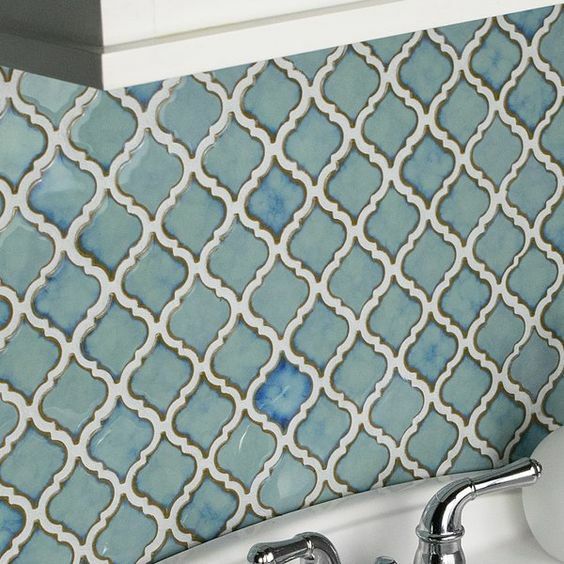 Hexa Navy Porcelain Mosaic Tiles. Source. Ceramic tiles are often posed as the alternative to porcelain tiles. While they look similar, there are some distinct differences which homeowners should know about before they make their decisions. Porcelain is 100% clay and fully cooked which creates its density level. Whereas a ceramic tile is a combination of many organic and inorganic materials and remains more porous because of its manufacturing process. And this means that a ceramic tile is certainly more prone to stains. It is more vulnerable and does not have as long of a lifespan as porcelain. However, it is easier to cut and to clean it. It is a legitimate option for residential kitchens and washrooms. Anywhere that gets a lot of foot traffic should opt for porcelain though since it can handle more wear-and-tear. Ship flag pattern porcelain tiles. Source. Anyone looking for a durable and attractive flooring option for their home should look no further than porcelain tiles. While the initial investment might raise some eyebrows, they look beautiful and last forever. What more could you want out of a floor after all?